The beginning of a new phase of Camden’s motoring history created much excitement and anticipation in March 1948 with the opening of the new ultra-modern car showroom for Clintons Motors at 16 Argyle Street. The Holden transformed suburban Australia, boosted national pride and quickly become a national icon. The car was economical, sturdy and stylish and was immediately popular with the public. The former Clintons Motor building was an iconic stylish Art Deco Interwar influenced building with its clean streamlined appearance drawn from American and French influences. The new showroom was described on the opening as ‘the most modern department store’ in Camden. A blue and white building with modernistic streamlined front and wide plate glass fittings. Inside, behind imposing doors set between giant white pillars, are to be seen a range of colourful displays that glistened beneath batteries of flourescent lights. Big placards mounted on plastic coated display stands illustrate the advice which Goodyear gives motorists in obtaining tyres. Other plastic and glass tables hold an unexpectedly large variety of accessories for cars and trucks. (Camden News, 18 March 1948). The new premises were constructed by Camden builder Jim Bracken on the former site of the Camden tweed mill which burnt down in 1899 and left a standing chimney for many years. During the Interwar period the site was used a horse paddock. The new premises sold tyres, motor accessories and electrical goods including refrigerators. The showroom ‘combined all the features that modern merchants in America have developed to improve their service to their customers’. (Camden News, 18 March 1948). The former Clintons Motors showroom is one of the first buildings that visitors encounter as they enter the town centre after crossing the Cowpastures Bridge and the Nepean River floodplain on the former Hume Highway (now Camden Valley Way). The former car showroom is just one of a number of Interwar buildings that visitors can find in the charming town centre. There is the former Bank of New South Wales (Westpac) building, the brick front of the show hall pavilion, the Dunk building car showroom, the former Rural Bank building, the former Stuckey Bakery building, the milk depot. Tucked around the corner is the former Paramount Movie palace and the Presbyterian church. Scattered in and around the town centre are a number of Californian bungalows which add to the atmospherics of the former country town. The Clinton group has a long history in the Macarthur region starting out a mobile theatre then moving into the Burragorang coalfields. In the 1930s they had a transport business moving coal from the valley to the Camden and Narellan railhead. The family formed Clinton Distributions which became an agent for General Motors Holden on 8 March 1945. Trading at Clinton Motors on the Hume Highway at Narellan the business sold Chevrolets, Pontiacs, Oldsmobiles, Vauxhalls, Bedfords and Maple Leaf trucks. The family incorporated the business in 1946 (Clinton Motor Group) and moved into Camden in February, (Camden News, 21 February 1946) opening the new showroom in 1948. The business operated on this site until 1992 then moved to the former site of Frank Brooking car yard and motor dealership at the corner of Cawdor Road and Murray Streets. Ian Willis, of Camden, writes (19 November): This week a new masthead appeared in the Camden Local Government Area called the Independent South-West published by King Media Regional based in Bowral, NSW. It was launched at Camden’s annual Light Up Festival. Editor Jane King and other staff handed out copies of the free monthly to families and friends who had come to see Santa, watch the fireworks and see the Christmas lights on the town’s Christmas tree. The 20-page tabloid is printed in colour on glossy paper and is sure to give the other three free Camden weeklies, the Macarthur Chronicle, the Camden Narellan Advertiser and the District Reporter, a run for their money. King says in Issue 1 that it “is an exciting new title…family owned and managed business”. She says that the paper will serve the local community and employ local people. The first issue certainly lives up to these promises by reporting the proceedings of the Moss Vale Local Court. Two matters dealt with involved Camden identities. Local court matters are now heard in Moss Vale since the closure of Camden and Picton court houses. The robust reporting of local court proceedings has largely disappeared from the other three Camden weeklies. A feature page, “Ark” Up, is written by journalist Juliet Arkwright who in another life was a councillor on Wollondilly Shire Council. This edition profiles the Acting President of the Camden Chamber of Commerce Maryann Strickling. The chamber states ‘we look forward to working with a truly independent newspaper’. The first edition also has copy provided by the local federal member, a photo feature of a fashion launch at Campbelltown, and content shared from the newspaper’s stablemate LatteLife Wingecarribee, which claims to be the “Heartbeat of the Southern Highlands”. King Media also publishes City Circular which, according to Miranda Ward at Mumbrella, replaced a void left by the closure of News Corps mX in 2015 and is distributed at railway stations. The first newspaper published by King Media group was the masthead LatteLife Sydney which started life in the Eastern Suburbs in 2010. King Media then expanded to publishing the Southern Highlands edition in 2014. The Independent’s print run of 10,000 will be distributed across localities from Cawdor to Leppington through local retailers, surgeries, real estate officers and other outlets. The print run is modest by comparison to its competitors in the Camden LGA and the publisher’s promises seem ambitious. King Media will support the print edition by managing a Facebook page. The conservative reporting of local matters by the Independent’s three Camden competitors certainly leaves a niche in the market place if controversies surrounding Camden Council continue as they have done in recent months. King has promised to “hold the Council to task” and take it up to other local papers. If she sticks to her promises the Independent South-West will fit in well with Camden’s fierce parochialism and localism. Ian Willis, of Camden, writes: On 1 September 2016 the local independent weekly, the District Reporter, published an eight-page wraparound supplement under the banner heading of the “Tahmoor Times Souvenir Edition”. It was “edition 1, volume 1” of a special edition that was “published every 100 years”. 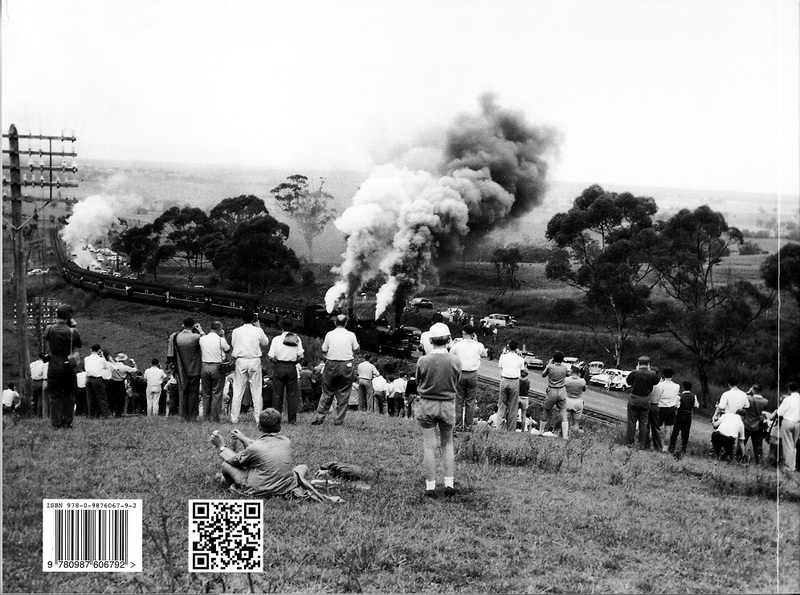 The supplement celebrated the centenary of the naming of Tahmoor NSW and the Back to Tahmoor celebrations. It was sponsored by the District Reporter and the Tahmoor Chamber of Commerce under its president Bob Clayton. The District Reporter is a free 16-page weekly published by a family owned company, Wombaroo Publishers, of Camden. The newspaper was launched in 1998 and has a distribution of 16,900 primarily across the Camden and Wollondilly Local Government Areas, including Tahmoor. The publication has a popular weekly local history feature on the back page called “Back Then” under the direction of newspaper editor Lee Abrahams. Volunteers read aloud the supplement to some of the residents at the local Carrington Convalescent Home. The idea of the supplement and its promotion were the brainchild of Bob Clayton who is variously described as a team of one taking on roles from journalist and political editor. Clayton’s editorial stated that he only published the supplement “every one hundred years” with the next edition in 2116. Clayton supplied the content with layout done by the District Reporter’s sales manager Noel Lowry. The supplement’s feature article “Bridge to Bridge – Tahmoor a History” presented an interesting collection of images with a short story of the history of the town. Past extracts from the Picton Post supported the story. For example, in 1933 local character Barney Abbot spotted a UFO from his farm paddock one night. Then there was an offer in 1934 to take a Ford V8 for a drive with a recent sighting of Elvis Presley in Tahmoor. Other centenary celebrations were outlined in the supplement and are a “Back to Tahmoor Day”, a history publication, a photographic exhibition, the development of a history walk and a time capsule for Tahmoor Public School. Storytelling occurs in all cultures and the “Tahmoor Times” supplement adds to some of the colourful yarns about the local area. Clayton said he would send a copy of the supplement to the National Library. The supplement provides an insight in to the area’s sense of place and its cultural landscape. Ian Willis from Camden writes (31 March): The Camden press excelled itself in recent weeks with an incredible coverage of the 2012 Camden Show. The show always gets strong support from the local weekly newspapers – Camden-Narellan Advertiser, Macarthur Chronicle (Camden Edition) and the District Reporter – and this year was no different. The amount of page space devoted to the show is worthy of special examination. Between January and March over 6300 column centimetres were devoted to the show matters, peaking in the weekly editions before the show. The Advertiser had an eight- page wrap-around, the Chronicle had a 12 page wrap-around while The District Reporter had a 24-page special edition, as well as its regular weekly edition. This was supplemented with extensive photo galleries on the newspaper websites and in their print editions after the show. In addition the Macarthur Chronicle offered to print a special front page for showgoers with their image at their show stall. The show committee supported this coverage with posters, pamphlets, programs, and television (first time 2011) and radio advertising. The Camden Show illustrates one of the key strengths of the local press, which in the case of Camden is becoming increasingly the local suburban press, its localness. The Camden community is in a period of transition located on Sydney’s rural-urban fringe and undergoing a crisis of identity. The role of the local press in the success of this annual festival cannot be understated. The annual show (23-24 March 2012) is the premier cultural festival for the community, runs over two days and in 2012 attracted over 38,000 people. The constant theme in all material related to the show was its role as ‘still a country show’. The event had all the trade mark features of the stereotypical country show from cakes to show bags to cattle and wood chopping. The relationship between the Camden press and the show juggernaut is mutually beneficial and illustrates the strength of Camden’s sense of place, community identity and local parochialism. The 2012 press coverage of the show illustrates the dynamic vibrancy of the local newspaper. In these days when the metropolitan press are increasingly under pressure the local press goes from strength to strength. Camden’s newspapers add to the resilience of the local community in the face of constant change on Sydney’s rural-urban fringe from urbanisation. 61.4.9 LIFE AS THE EDITOR OF A SMALL COMMUNITY PAPER Ian Willis reports from Camden: The editor/proprieter Lee Abrahams of the District Reporter addressed the Camden Historical Society on the life of an editor of a small community newspaper on 9 February at the Camden Museum. The District Reporter is owned by Lee Abrahams and Noel Lowry, of Camden. It is a 16pp free weekly published in Camden NSW each Monday. Abrahams maintains that it has a ―quirky style that concentrates on local and rural news. The most popular sections are the back page feature, ―Back Then, on local history, followed by ―The Diary, which is a summary of local community events. The paper has a print run of 17,000 which is circulated in the Camden and Wollondilly Local Government Areas. It is printed at Marrickville. 62.3.1 CAMDEN, NSW (1): FOOTY’S BACK Ian Willis reports from Camden: On 8 March two of Camden‘s weekly newspapers, Fairfax Media‘s Camden-Narellan Advertiser and Cumberland Newspaper Group‘s Macarthur Chronicle, both published eight-page wraparounds featuring the Wests Tigers Rugby League teams. Under the banner headline, ―NRL Glory Calls‖ player Loti Tuquiri was featured in a full-page feature in the Chronicle, complemented by a season draw. The Advertiser went further and had two popular players, Chris Lawrence and Gareth Ellis, in a double page spread, while the inside two pages featured a ―Footy Tipping Guide for the die-hard fans. All for the start of the official footy season! 62.3.2 CAMDEN, NSW (2): THE SHOW Ian Willis reports from Camden: Camden‘s three free weeklies each had a major feature on the 125th 2011 Camden Show. The show is a yearly event and is promoted as the largest regional show in Australia, with expected attendances in excess of 30,000. The District Reporter, an independent, published a 24-page special advertising feature for the event, which is ‘still a country show‘. Items ranged from the opening by the Governor-General, to entertainment, horse events, grand parade, Miss Showgirl, and a guide to community groups performances (schools, community band) and local artists. The Cumberland Press‘s Macarthur Chronicle had a 12-page wraparound and noted that the show was still going strong‘ after 125 years, and the appearance of the ―G-G was the ―icing on the cake. It was reported that the inaugural show in 1886 was ―met with enthusiasm and approval‖ by those attending. Fairfax‘s Camden-Narellan Advertiser had an 8 page wraparound ‗souvenir edition‘ and featured a double page spread of an attractive young bloke‘ from the show organising committee, Daniel Dickenson. Daniel stated that he was ‘dedicated to making sure the country show continue[d] for many years‘, while the Advertiser assured its readers that the show was ―an age-old event that stop[ped] Camden in its tracks. 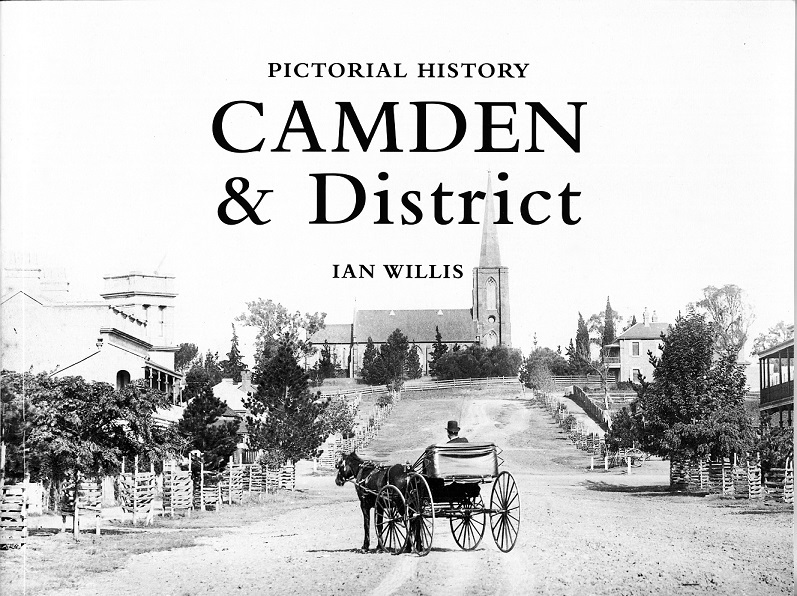 63.4.4 Ian Willis reports from Camden: An account of life as the editor/proprietor of the District Reporter, Lee Abrahams, was published in the March journal of the Camden Historical Society, Camden History. The District Reporter is a 16pp free weekly published each Monday in Camden. Lee Abrahams and her husband Noel started the newspaper as a monthly in 1997 in the Austral area. They moved the paper to Camden to fill a vacuum left by the closure of the Camden Crier, a free weekly. The Reporter has a circulation of 17,000 and a footprint of 37,000 homes. It has been online for 12 months with around 200 weekly downloads. The most popular feature is the weekly history page, Back Then‘. According to Abrahams the masthead colours of blue and green reflect the rural landscape of sky and grass. Ian Willis reports: The Macarthur Chronicle announced a complete digital edition of the newspaper in its issue of 23 February. The online edition also provides access to archives of the newspaper containing issues for the last two years, an online index and a host of live hyperlinks. From Camden, Ian Willis writes: The Macarthur Chronicle (Cumberland Courier Newspapers, with Campbelltown and Camden editions) recently had a 16-page wrap-around to celebrate its 25th anniversary. The feature reproduced a number of the front pages from over the last 25 years. These illustrated the changes to the masthead (nine all up), the introduction of colour photographs on the front page in 1991 and the changing format of the presentation with the greater emphasis on images and less on text. The foundation editor Chris Wharton (now chief Western Australian Newspapers) recalled how Greg Evans and Debbie Newsome of the top rating TV show Perfect Match launched the first edition. The cover story of the 36 page first edition was the arrival of baby Andrew James Packer, a healthy baby delivered at Camden Hospital. The current editor Mandy Perrin, who assumed control in 1993, recalled how she started as a cadet journalist nine months after the Chronicle was launched. Under her leadership the Chronicle has grown and in 2006 split into three editions for Camden, Campbelltown and Wollondilly and had its first online edition. The 25th commemorative edition had 128 pages and according to Bob Osburn (editor-in-chief of Cumberland Courier Newspapers) 123,000 readers. There were many tributes on the anniversary from civic leaders. Michael Knight, former Campbelltown State Labor MP, stated that “local newspapers succeed best when they become part of the fabric of their community… And that’s precisely what the Chronicle has done”. Ian Willis again: The Camden Advertiser issued on 10 February a 16 page wrap-around celebrating 130 years of newspaper publishing from 1880 to 2010. The supplement had the genealogy of the newspaper and its antecedents. In all, the newspaper family tree identified 20 different mast-heads that were related to the Camden Advertiser. These included local newspapers published in Camden, Campbelltown, Picton and Ingleburn. The birth of the newspaper group took place with the Campbelltown Herald first published on 14 February 1880 by William Webb. The history of the newspaper group in the feature was divided into a number of sections: 1. The Great Pioneers 1880-1900, 2. The Builders 1900-1920, 3. The Sidman Supremacy 1920-1938, 4. The War Years 1938-1949, 5. Goodbye to the Sidmans, 6. The Heyday of S. Richardson Newspapers, 1952-1982, 7. The Hard Years 1982-1987, 8. From Strength to Strength, 8. Modern, But Traditional. Since 2006. The publishers of these newspapers were colourful local identities and they all made an indelible mark on their communities. The feature provides an interesting glimpse, if brief, into the role of the local newspaper in a small community, with their parochialism, localism and parish pump politics. The feature has 17 photographs with a number of reproductions of front pages. There are also interviews with a number of surviving staff who worked for some of the newspapers in the group. The front cover of the feature is an interesting juxtaposition between then and now, with a reproduction of the 1880 Camden Times, with a local reporter, MIchelle Taverniti reflecting on an 1880 version of herself. Ian Willis, “The Women’s Voluntary Service: A Study of War and Volunteering in Camden, 1939-1945”, PhD thesis, Department of History and Politics, University of Wollongong, The thesis is a local study of wartime Camden through an examination of a war-specific voluntary organisation, the Women’s Voluntary Service. The aim of the thesis was to unravel the social processes and cultural traditions at work in the town’s female philanthropy, and, by so doing, tease out the main threads of Camden’s wartime experience. The thesis encompasses the involvement of Camden’s press in these processes. 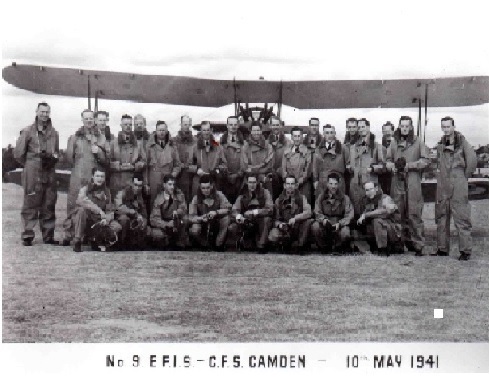 WILLIS, Ian (Camden, NSW): Work in progress – PhD, “The Women’s Voluntary Services: a case study of war and voluntarism in Camden, 1939-1945”; principal source dfocuments, Camden News (owner George Sidman) and Camden Advertiser (owner Arthur Gibson). Address: PO Box 304, Camden, 2570. Ian Willis writes from Camden, NSW: Fairfax Community Newspapers issued a special edition of their Sydney suburban newspapers on 26-27 December 2006 and 2-3 January 2007 called the Holidayer. The issue covered 14 suburban newspapers across the south, south-west and western parts of Sydney. Titles included: Campbelltown Macarthur Advertiser, Camden Advertiser, Wollondilly Advertiser, South Western Rural Advertiser, Liverpool City Champion, Fairfield City Champion, Parramatta Sun, St George & Sutherland Shire Leader, Penrith City Star, Hawkesbury Independent, Blacktown Sun, St Mary’s-Mt Druitt Star, Hills News, Northern News. The Camden edition carried local stories and advertisements from local businesses. There were also stories on holiday activities across western, south-western and southern Sydney under the heading “Get out, go do it”. Ian Willis, of Camden, has sent us a copy of The Berry Alliance Town Crier, a quarterfold produced by the Berry Small Towns Alliance Inc. which sets out to “provide communication to the people of Berry about community activities and to generate a small income for the Berry Alliance to cover administrative costs”. Editor is Bonnie Cassen. Issued monthly, it has a distribution of 1800. The September issue carried 24 pages. From Ian Willis, of Camden, NSW: The Camden Advertiser (23 August 2006) had a 16-page wrap-around on the theme “Living in the 70s”. It included a series of three articles that recalled the front pages of the Campbelltown-Ingleburn News, the Camden News, and the Picton Post in 1976. The stories related to local issues surrounding planning and the new Macarthur Growth Centre, parking, a new bridge over the Nepean River, and Camden retaining its “rural charm”. The Camden Advertiser (20 Sept. 2006) carried a 12 page advertising feature liftout on “Living in the 80s”. The feature carries an overview of the newspaper stories of the period, with a concentration on 1986. It features the front-page stories of that year including a “heated war of words” between the mayor of Campbelltown, Guy Thomas and Campbelltown’s Labor MP Michael Knight. Ian Willis reports from Camden, NSW: Our local newspapers treat the men and women who contributed to the Victorian Fire situation as local “heroes” in the finest tradition of the bushman and Anzac legends. The front page of the Camden Advertiser of 18 February reads “FACES OF GENEROSITY” with the story starting: “As bushfires wreaked destruction on lives in Victoria, Camden sprang into action. Our firefighters flew in to meet the flames, and thousands of dollars of donations have poured in to support relief.” The story ran through to pages 2 and 3 with photographs of RFS volunteers, school children holding fundraising events and other community fundraising events. Our weekly independent, the District Reporter led on 16 February with a story “COMMUNITY SHOWS IT HAS A BIG HEART”, outlining the efforts of a local Catholic independent high school and its fundraising effort with photographs of the young people at the school. This was supported with a page 5 story about donations collected at a local shopping centre. The Cumberland Newspaper Groups is represented in our local area by the Camden Edition of the Macarthur Chronicle. On 17 February it led with a story headed “OUR FINEST”. The story outlined the efforts of the Macarthur RFS unit and stated “the Macarthur region’s exhausted firefighters arrived home last week into the arms of loved ones after experiencing hell on earth”. The story outlined the efforts of efforts of our local heroes defending homes, electricity switching stations, and general fire fighting. Colin Spinks, the deputy group officer and member of the Camden West RFS brigade stated: ‘(the fire) would come down and the wind would turn back again. There was no saying where the wind was going to come from”. This was supported with extensive coverage of local fundraising events on pages 4, 5 and 6. David Campbell reported that “the heartbreaking plight of the bushfire victims in Victoria has prompted a generous response from the Macarthur region”. Ian Willis writes: The Macarthur Chronicle, which is part of the Cumberland Newspaper Group, has launched a new website for its local Macarthur newspapers. These are Macarthur Chronicle (Campbelltown Edition), Macarthur Chronicle (Camden Edition), Macarthur Chronicle (Wollondilly Edition). The three newspapers are on the front page of the website then linked to local stories for each edition. The site is located at http://www.macarthurchronicle.com.au/. Willis, Ian, presented a paper at the Australian Historical Association 2006 Biennial Conference at the Australian National University on Genres of History. The paper title was “Looking at Regional Identities on the Homefront” and concerned the role of country newspapers as an important historical source. He used the case study of the Camden News and Camden Advertiser, during World War II. The paper examined the regional identity of conservatism and its representation in the wartime reporting in Camden press as patriotism. One of the most popular memories of the Camden area by locals and visitors alike is the Camden branch line and its famous locomotive Pansy. It has a truly dedicated and enthusiastic bunch of supporters who positively drool about it and overlook its foibles. Old timers tell and retell stories to anyone who wants to listen, all laced with a pinch of exaggeration and the romantic. A part of local nostalgia. 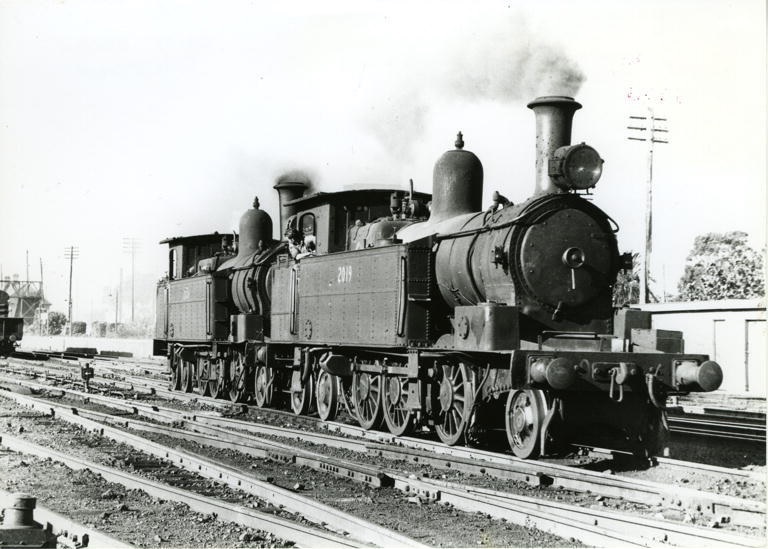 Steam engines and locomotives bring back memories of the glory days of industrialization and the great days of Australian nationalism in the late Victorian and early 20th century. Great monstrous engines that hissed, spat and groaned. They were mighty machines that were living beings. They had a life and soul of their own. They were responsible for creating the wealth of the British Empire. And Pansy is part of that story. 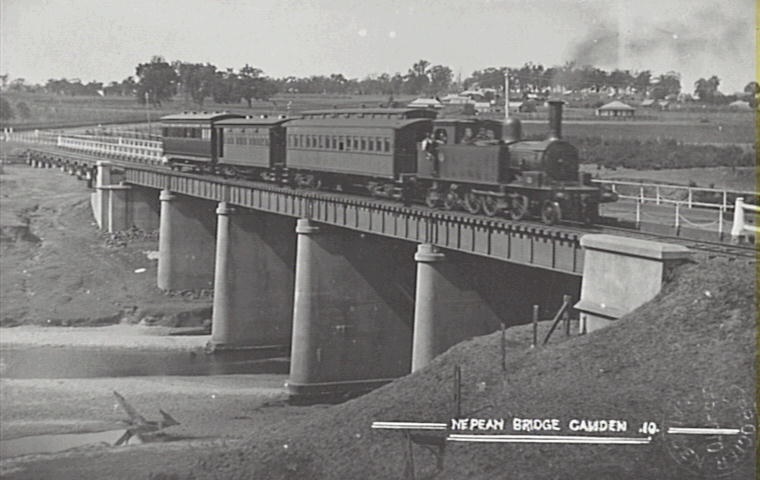 The Camden branch line was operated by the New South Wales Railways from 1882 to its closure in 1963. The Camden tram was one of a number of standard gauge light rail lines in the Sydney area. The tank locomotive worked a mixed service that took freight and passengers. 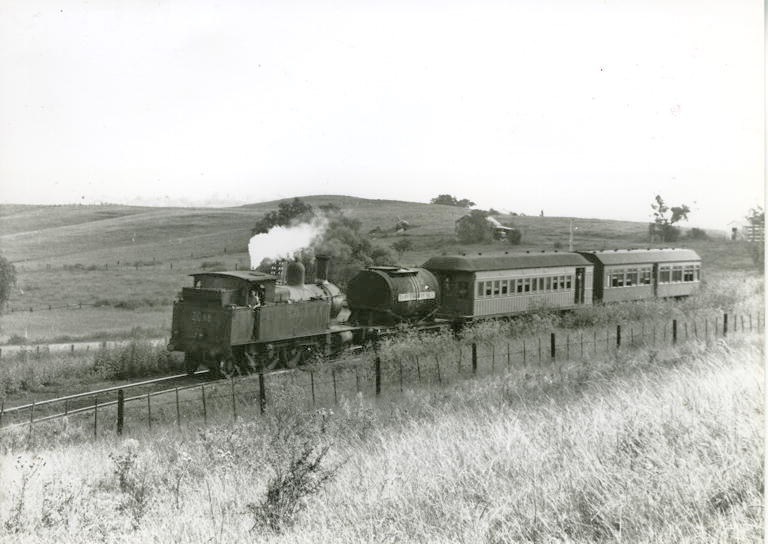 The branch line was thirteen kilometres and had eight stations after leaving Campbelltown station, where it joined the Main Southern Railway. The stations were Maryfields, Kenny Hill, Curran’s Hill, Narellan, Graham’s Hill, Kirkham, Elderslie and finally arriving at Camden. Most of the stations were no more than a short rudimentary wooden platform with a shelter shed that were unmanned. Others like Camden had a longer platform and an associated goods handling facility. Pansy was a regular part of daily life for those who lived near the line. Locals in the Camden township would listen for the loco’s whistle and know that the morning papers had arrived from Sydney. Legend has it that the engine driver would hold the train for regulars who were running late for work on their way to the city, especially local lasses. Some of Camden’s better off families sent their children to high school at Parramatta and Homebush each morning on the train. Pansy would chug past the milk factory at the entry to Camden township as local dairy farmers were unloading their cans of milk from their horse and dray. Tourists from Sydney would be dropped off on Friday afternoon at Camden station to be bused to their holiday boarding houses in Burragorang Valley. The first passenger service left Camden station left at 5.47am to connect with the Sydney service on the Main Southern Line. On the return journey the last passenger service from Campbelltown left at 9.44pm. During the Second World War the train provided transport for many servicemen (Army, RAAF) who were based at local military establishments. Airmen from Camden airfield would catch the train to Sydney for weekend leave, and would be joined by soldiers from Narellan military base and Studley Park Eastern Command Training School. Camden station and good yards were located adjacent to Edward Street, with a siding to the Camden Vale milk factory. Coal from the Burragorang Valley mines was loaded at Camden yard from 1937, although this was transferred to Narellan in 1941 and eventually the Main Southern Line at Glenlee into the late 1950s. But even by the 1940s the limitations of the line for caring freight were showing cracks. From its enthusiastic opening the the branch line never really lived up to its predictions. The mixed goods and passenger service was of limited value. Its light gauge restricted the loads and the grade of the line, particularly over Kenny Hill, severely limited its capabilities. Even in 1939 there were already signs of the eventual demise of the branch line with more coal leaving the district by road than rail. Its days were numbered and the writing was on the wall. Its death blow was delivered by the Heffron ALP Government in 1963 as a cost cutting exercise and a drive from modernization of the railway system across the state. Diesel was the new god. For current enthusiasts with a keen eye there are remnants of the embankments and cuttings for the standard gauge line still visible in the area. As visitors leave the Camden township travelling north along Camden Valley Way (old Hume Highway) embankments, culverts and earthworks are still visible in the farm paddocks on the Nepean River floodplain. You can make out the right of way as it crosses Kirkham Lane and heads towards Narellan before disappearing into a housing estate. For those with a sharp eye a cutting is still evident on the northern side of Narellan Road at Kenny Hill just as you take then entry ramp onto the freeway going to Sydney. It appears as a bench above the roadway and is evident for a short distance. (for details see Peter Mylrea, ‘Camden-Campbelltown Railway’, Camden History March 2009, p. 254-263). A number of streets in Curran’s Hill are connected to the history of Pansy. Tramway Drive is close to the route of the train and a number of other streets are named after past railway employees, for example, Paddy Miller. The Camden Community Band has added the tune ‘The Camden Train’ to its repertoire. The lyrics tell an interesting story about Pansy, the locomotive. It was written by Camden local Buddy Williams about the time of the last run on of the train in 1963. Do you want to see the real deal for yourself? Go and inspect the one of the locomotives on display at Trainworks Railway Museum, Barbour Rd Thirlmere NSW 2572 (02) 4681 8001. Watch a DVD about the Camden Branch Line next time you call into the Camden Museum. 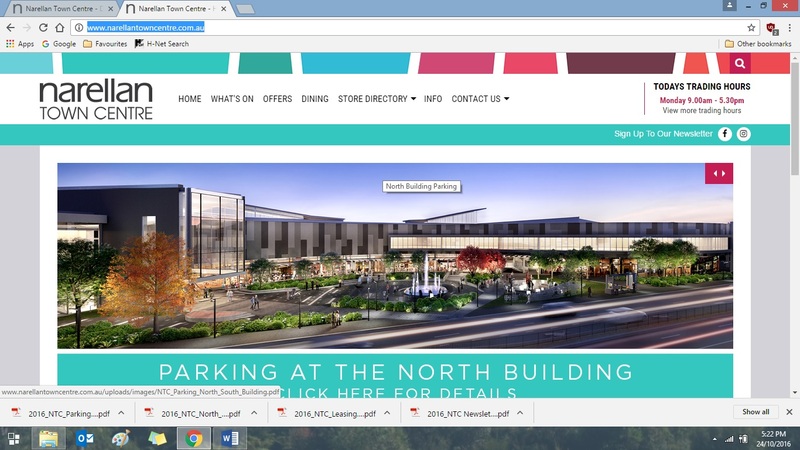 There has been an attempt at place making in Narellan in the new extension of the local shopping mall, Narellan Town Centre. New civic plazas and entertainment precincts including a fantastic indoor / outdoor restaurant and casual dining precinct where you will be able to sit down and relax with friends day and night. The centre owners and designers have attempted to create a space where local folk can have social encounters and exchange and meet other people. This type of space attempts to strengthen the local economy, inspire community by having the look and feel of a village market square. The space aims to be walkable and draw people into it. Place making is community driven and for it to be meaningful individuals should be allowed the make their own interpretation of the space. The plaza is an attempt at place making where a space allows people to make their own story. They can create meaning for themselves by interacting with family and friends. The plaza has attempted to create its own cultural and social identity. This has been achieved by including a water feature, street furniture and public art. One of the pieces of public art if a stylized Elderslie banksia, an endangered species, of the local area. 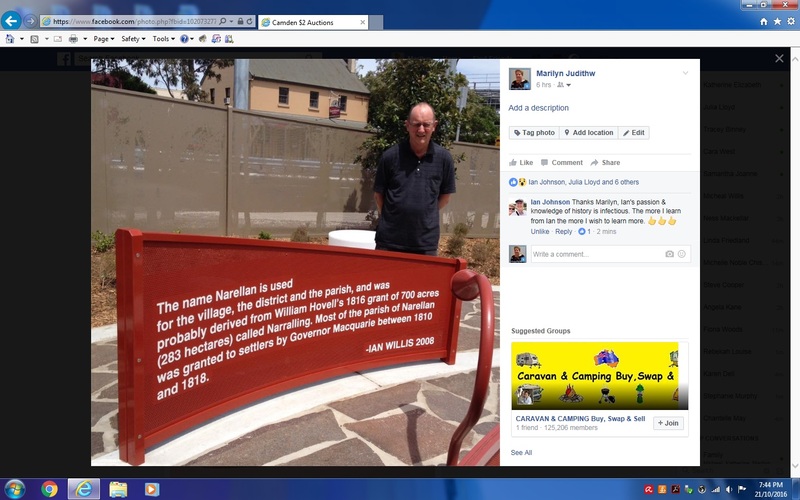 There are also quotes from the history of the Narellan story by local historian Dr Ian Willis on two separate panels. There are also dioramas of Pansy the Camden train that ran through the site of the shopping centre extension, as well as cows and open pastures motifs. All these are part of the character of the development of the Narellan story, with its rural past, icon train and Narellan Railway Station. So far the planners seem to have achieved their aims with early usage by local families. There mothers and children interacting, with some taking souvenir photos for family memoirs. The surrounding food outlets were busy creating a buzzy feel to the site. Workmen fitting out surrounding commercial outlets sat in the sun having their lunch. The area also has a number of financial outlets that will draw more people to the space. The plaza so far seems to quite popular and achieved the aims of the designers. [i] Kylie Legge, ‘The evolution of placemaking – what’s next?’, Newplanner, September 2015, pp4-5. 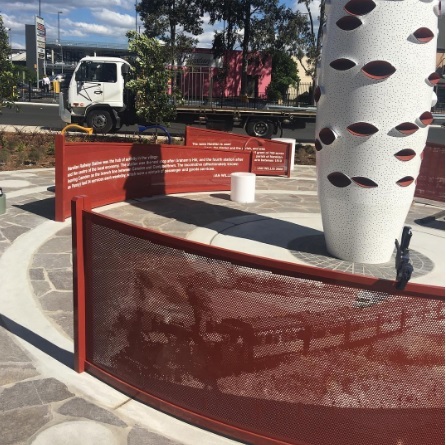 [ii] Kylie Legge, ‘The evolution of placemaking – what’s next?’, Newplanner, September 2015, pp4-5. Ben Linden is an outstanding example of the Edwardian cottages across the local area. Camden has quite a number of Edwardian cottages in the town area, on surrounding farms and in local district villages. They are typical of the early twentieth century landscape in the local district. The housing style was evidence of the new found confidence of the birth of a new nation that borrowed overseas trends and adopted them to suit local conditions. These style of houses were a statement of the individualism and the national character. The name Edwardian is loosely attached to cottages and buildings erected during the reign of Edward VII from 1901 to 1910. This period covers the time after the Federation of the Commonwealth of Australia in 1901 when the six self-governing colonies combined under a new constitution. They kept their own legislatures and combined to form a new nation. Examples of Edwardian style cottages, including in and around Camden, were an Australian version of English Edwardian houses. Houses were plainer in detail, some with lead lighting in the front windows. Australian architecture was a response to the landscape and climate and the building style tells us about the time and the people who built them, how they lived and other aspects of Camden’s cultural heritage. The Edwardian style of housing also includes a broad range of styles including Queen Anne, Federation, Arts and Crafts and Early Bungalow. These styles often tend to be asymmetrical with a projecting from gable, can be highly decorated with detailed work to gables, windows and verandahs. Edwardian style cottages often fit between 1900 and 1920, although the style extends beyond this period influencing the Interwar style housing. Ben Linden was constructed in 1919 by George Blackmore originally from North Sydney. George Blackmore, born in 1851 was married to Mary Ann and had seven children. 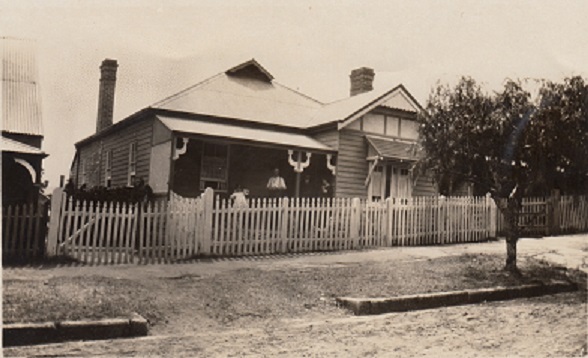 George and his family lived in Ben Linden from 1921 to 1926. After this time he retired as a builder and eventually died in 1930. 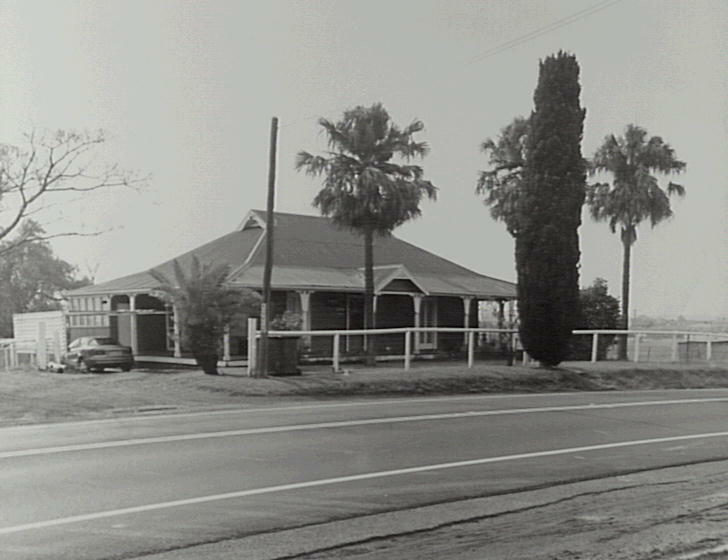 George’s son George Sydney Blackmore, who was a merchant, lived across the road from Ben Linden in the 1920s with his wife Rena and two boys at Narellan Stores at 332 Camden Valley Way. The house is located on Edward Lord’s 1815 grant of Orielton Farm, which in the 1830s was a reported as a productive farm mainly used for grazing. In the 1870s the hunting seemed to be a popular pastime with the pursuit of live hares by greyhound by owner William Rudd, when it was described as a grazier’s property. By 1920 it was recorded that there ‘out-houses, building, erections and fences’ on the property. A number of Camden Edwardian style timber cottages have a projecting room at the front of the cottage with a decorated gable, adjacent to a front verandah, with a hipped roof line. This housing style is often characterised by a chimney that was a flue for a kitchen fuel stove and chip copper in an adjacent laundry. In some houses plaster cornices were common, sometimes there were ceiling roses, skirting and architraves. A number of been restored while unfortunately many others have been demolished. Some Camden Edwardian homes had walls of red brickwork, sometimes with painted render in part. While there are many examples in the local area of timber houses with square-edged or bull-nosed weatherboards. 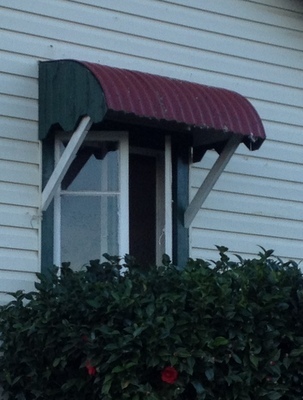 Sunshades over windows supported by timber brackets are also common across the local area. Doors in Edwardian style houses typically have three or four panels, with entry doors sometimes having an ornamentation. Common windows were double hung while later cottages may have had casement windows especially in the 1920s. Some cottages have return L-shaped verandahs, sometimes roofed with corrugated bull-nosed iron. Verandah post brackets had a variety of designs, with lattice work not uncommon feature. Verandahs featured timber fretwork rather than Victorian style cast ion lacework for ornamentation. Front fences may have had pickets, or just a wire fence in country areas. Typical Edwardian colour schemes range from apricot walls, gables and barge boards, with white lattice panelling, red roofing and green coloured windows, steps, stumps, ant caps. Gardens were often more complex than Victorian examples. Amongst Edwardian gardens growing lawns became popular. Sometimes had a small tree in the front yard which could frame the house and might separate it from adjacent houses. Common trees included magnolia, elm, tulip tree or camellias, while shrubs and vines might have been agapanthus, agave, St John’s Wort, plumbago, standard roses, begonias, day lily, jasmine and sometimes maidenhair ferns. In the March 2014 edition of Camden History Joy Riley recalls the Edwardian cottages in John Street. Joy Riley vividly remembers growing up as a child and calling one of these cottages her home. 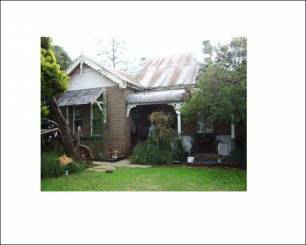 ‘I lived at 66 John Street for the first 40 years of my life before moving to Elderslie with my husband Bruce Riley. The two rooms of 66 John Street were built by the first John Peat, Camden builder, to come to Camden. In the 1960s I had some carpet put down in my bedroom, the floor boards were so hard, as they only used tacks in those days to hold carpet, the carpet just kept curling up.’ She says, ‘The back of the house was built by my grandfather, William Dunk. They lived next door at 64 John Street. He also built the Methodist Church at Orangeville or Werombi. One of the most popular memories of the Camden area by locals and visitors alike is the Camden tram, affectionately known as ‘Pansy’. It has always had an enthusiastic bunch of supporters. They positively drool about it and overlook its foibles. Old timers tell and retell Pansy stories to anyone who wants to listen. Fans gloss over its short comings. All the stories are laced with a pinch of nostalgia and a touch of the romantic. It was a vital part of local life. So why does this old locomotive conjure up such a strident bunch of supporters? Steam engines and locomotives bring back memories of the glory days of industrialisation and the great days of Australian nationalism in the late Victorian and early 20th century. Great monstrous engines that hissed, spat and groaned. They were mighty machines that were living beings. They had a life and soul of their own. They were responsible for creating the wealth of the British Empire. And Pansy is part of that story. The Camden branch line was operated by the New South Wales Railways from 1882 to its closure in 1963. The Camden tram was one of a number of standard gauge light rail lines in the Sydney area. The tank locomotive worked a mixed service that took freight and passengers. 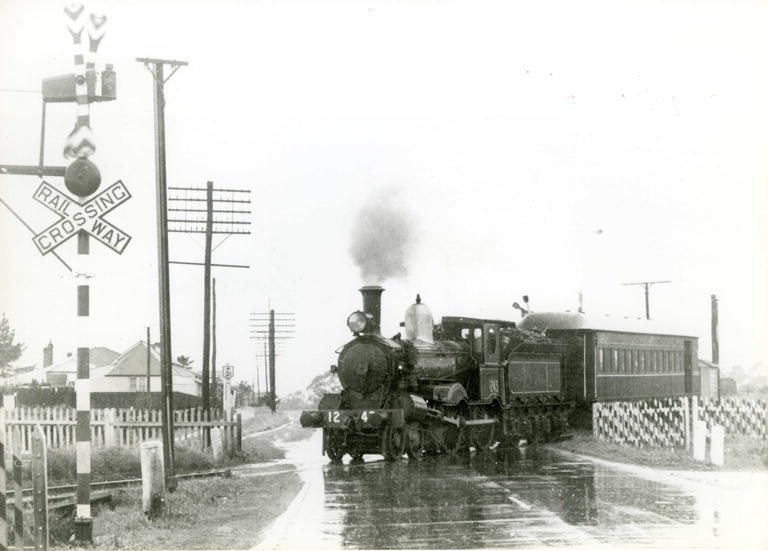 The branch line was thirteen kilometres and had eight stations after leaving Campbelltown station, where it joined the Main Southern Railway. The stations were Maryfields, Kenny Hill, Curran’s Hill, Narellan, Graham’s Hill, Kirkham, Elderslie and finally arriving at Camden. Most of the stations were no more than a short rudimentary wooden platform with a shelter shed that were unmanned. Others like Camden had a longer platform and an associated goods handling facility. Pansy 1963 on its last run Pansy was a regular part of daily life for those who lived near the line. Locals in the Camden township would listen for the loco’s whistle and know that the morning papers had arrived from Sydney. Legend has it that the engine driver would hold the train for regulars who were running late for work on their way to the city, especially local lasses. Some of Camden’s better off families sent their children to high school at Parramatta and Homebush each morning on the train. Pansy would chug past the milk factory at the entry to Camden township as local dairy farmers were unloading their cans of milk from their horse and dray. Tourists from Sydney would be dropped off on Friday afternoon at Camden station to be bused to their holiday boarding houses in Burragorang Valley. The first passenger service left Camden station left at 5.47am to connect with the Sydney service onthe Main Southern Line. On the return journey the last passenger service from Campbelltown left at 9.44pm. During the Second World War the tram provided transport for many servicemen (Army, RAAF) who were based at local military establishments. Airmen from Camden airfield would catch the train to Sydney for weekend leave, and would be joined by soldiers from Narellan military base and Studley Park Eastern Command Training School. Camden station and good yards were located adjacent to Edward Street, with a siding to the Camden Vale milk factory. Coal from the Burragorang Valley mines was loaded at Camden yard from 1937, although this was transferred to Narellan in 1941 and eventually the Main Southern Line at Glenlee in the late 1950s. But even by the 1940s the limitations of the narrow gauge line for caring freight were showing cracks. From its enthusiastic opening the tram never really lived up to its predictions. The mixed goods and passenger service was of limited value. Its light gauge restricted the loads and the grade of the line, particularly over Kenny Hill, severely limited its capabilities. Even in 1939 there were already signs of the eventual demise of the branch line with more coal leaving the district by road than rail. For current enthusiasts with a keen eye there are remnants of the embankments and cuttings for the narrow gauge line still visible in the area. As visitors leave the Camden township travelling north along Camden Valley Way (old Hume Highway) embankments, culverts and earthworks are still visible in the farm paddocks on the Nepean River floodplain. You can make out the right of way as it crosses Kirkham Lane and heads towards Narellan before disappearing into a housing estate. For those with a sharp eye a cutting is still evident on the northern side of Narellan Road at Kenny Hill just as you take then entry ramp onto the freeway going to Sydney. It appears as a bench above the roadway and is evident for a short distance. (for details see Peter Mylrea, ‘Camden Campbelltown Railway’, Camden History March 2009, p. 254263). A number of streets in Curran’s Hill are connected to the history of Pansy. Tramway Drive is close to the route of the train and a number of other streets are named after past railway employees, for example, Paddy Miller. The Camden Community Band celebrates the legend of Pansy in their repertoire. They play a tune called The Camden Tram written by Buddy Williams a Camden resident of the 1960s. The Camden Community Band has recently added the tune ‘The Camden Train’ to its repertoire. The lyrics tell an interesting story about Pansy, the locomotive. It was written by Camden local Buddy Williams about the time of the last run on of the train in 1963.